Few cultures have had as much of a lasting impact on map of Europe as the Roman Empire, which lasted between 27 BC and 395 AD, ending with a split between the Eastern and Western halves at the start of the Dark Ages . The early Roman state began from settlements along the Tiber River in present-day Italy. Legend suggests that the Romans came from Romulus and Remus who were sons of the War God Mars, and defeated an earlier King, starting their own monarchy. In 509 BC, the monarchy was overthrown and Rome became an Republic, based off of Greek models . The Republic lasted until 27 BC, when the state shifted to an autocratic regime after internal political struggles and the well-known murder of the general Julius Caesar. From this point it remained as an Empire ruled by the first emperor Augustus. The empire expanded dramatically leading up to the death of Caesar, and beyond. It has reached far into the Middle East, North Africa, and Northern Europe, conquering as far north as present-day Scotland in the United Kingdom. This vast empire maintained a high degree of internal stability and marked a major achievement in terms of human political organization . The decline and eventual collapse of the Roman Empire marked the start of a major shift in the political landscape of Europe, with the empire divided between a loosely organized western half and a separate eastern part, with its capital in Constantinople, which is now present-day Istanbul . Julius Caesar in his conquests of Gaul, which now form present-day France, had invaded the southern British Isles in 55 BC, but it was not until the period of Emperor Caligula that Britain was formally colonized, starting in 43 AD . Roman Britain extended as far north as Southern Scotland and became defined by the building of a wall across the Island of the Britain in what is present-day Cumbria, known famously as Hadrian’s Wall . Cultural artefacts and ancient writing found have indicated the spread of diverse cultures and groups of people across the Roman Empire into Britain, which flourished during Roman times, partly due to the introduction of new farming techniques and efficiently administered political and exchange structures . A wide range of archaeological and historical sources –from inscriptions on pottery to wax writing tablets - suggest that the Roman population in Britain had diverse geographical origins . The Roman army stationed in the country was likely to have been comprised of soldiers from across the Empire . Along Hadrian’s Wall where many such soldiers were stationed archaeologists have uncovered temples and shrines to native gods from Iran Iraq and, Syria. Long before the Romans arrived, the Middle East was home to an impressive array of trade routes, such as the Silk Road, which was used by merchants, mercenaries and pilgrims . Luxury goods – such as silks and spices – along with services were transported over long distances. When the Roman Republic succeeded in bringing much of the Near East under its control in the 1st century AD, trade routes connecting Western Europe and as far east as China were forged. Although the Roman Empire warred unceasingly with the neighbouring Persian Empire, the border of these two mighty powers became a site of continual cultural exchange . As centralized power waned in the Roman Empire as it entered the 5th century AD, Roman Britain was abandoned in 410 AD, leaving a political vacuum that left the population vulnerable to invaders from the east and north . 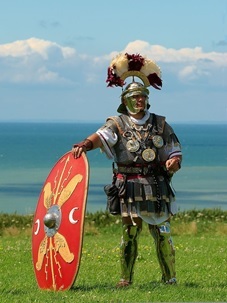 The collapse of Roman Britain lead to a period of turbulence that ultimately ended with the Anglo-Saxon takeover of large parts of present-day England. The present-day city of York in Northern England was founded in 71 AD and was known to the Romans as ‘Eboracum’. From the time of its founding it was an important center for both civilian and military activities, later becoming the northernmost provincial capital of the Roman Empire . York is a major source of archaeological evidence from the Roman period in Britain. Between 2004 and 2005 a Roman cemetery revealing over 80 burials and cremations was excavated along Driffield Terrace, a stretch of road approaching York from the southwest . The burials included men that had been decapitated with their skulls placed between their knees or feet, earning them the nickname the ‘Headless Romans’ . Evidence from their skeletons indicated that they had experienced violent deaths and stressful childhoods, due to markers on the skeleton that indicate poor nutrition . These conditions have prompted speculation about who these men were, with some suggesting they may have been gladiators, fallen roman soldiers, or high-ranking citizens who had been condemned to execution [11-12]. The seven individuals from this site was carbon-dated to between 100 and 300 AD (1,899 and 1,600 years ago) . Genetic analysis has shown that most of the people buried at Driffield terrace were of western European origin, apart from one unusual individual. Skeletal analysis showed this man was under 45 years old and he was taller than the average Roman. Genetic analysis showed he had dark hair and brown eye and carried genetic markers indicating he was probably of Middle Eastern origin. This set him apart from the samples taken from the Driffield site who had genetic signatures more typical of other Western Europeans . He most likely originated from within an area that is presently in the countries of Palestine, Jordan or Syria and represents a unique example of the extremes of migration within the Roman Empire. He carried an H5 mitochondrial haplogroup, which is common of both Europeans and people from the Middle East, but his Y chromosome was more unusual. He belonged to the Y chromosome J haplogroup, which is most common in the Middle East today, and also exists more rarely in Southeastern Europe. It is thought to have its origins in West Asia around 50,000 years ago [13-14]. Five individuals belonging to the mitochondrial haplogroup H6, which is commonly found in Europe and the Middle East today. It has also been found in Mesolithic hunter-gatherers, and existed in Europe prior to the arrival of agriculture . One individual belonged to the mitochondrial J haplogroup, which is also common among Europeans today . All of these other men belonged to Y chromosome haplogroup R1b, which is common among Western European males today, and arrived in Europe thousands of years earlier with the appearance of agriculture . Boatwright MT, Gargola DJ, Talbert RJA. 2004. The Romans: from village to empire. Oxford University Press: Oxford. Mousourakis G. 2007. A Legal History of Rome. Routledge: London. Fulford M. 1992. Territorial Expansion and the Roman Empire. World Archaeology 23: 294-305. Kaldellis A. 2012. From Rome to New Rome, from empire to nation-state: reopening the question of Byzantium’s Roman identity,’ In Grig L, Kelly G (eds.) Two Romes. Rome and Constantinople in Late Antiquity Oxford University Press:Oxford pp. 387–404. Salway P. 1993. A History of Roman Britain. Oxford University Press: Oxford. Breeze DJ, Dobson B. 1978. Hadrian’s Wall, Revised edition. Pelican: Harmondsworth. Eckardt, H., & Müldner, G. 2014. People on the move in Roman Britain. World Archaeology 46: 534–550. Leach et al. 2009. Migration and diversity in Roman Britain: a multidisciplinary approach to the identification of immigrants in Roman York, England American Journal of Physical Anthropology 140: 546-561. Goldschmidt A Jr. 1988. A Concise History of the Middle East, 3rd edition. Westview Press: Boulder, Colorado. Farrokh K. 2007. Shadows in the Desert: Ancient Persia at War. Osprey Publishing: Oxford. Müldner, G., Chenery, C., & Eckardt H. 2011. The ‘Headless Romans’: multi-isotope investigations of an unusual burial ground from Roman Britain. Journal of Archaeological Science 38: 280–290. Martiniano, R. et al. 2016. Genomic signals of migration and continuity in Britain before the Anglo-Saxons. Nature Communications 7: 10326. Sykes B. 2001. The Seven Daughters of Eve. London; New York: Bantam Press. Semino O, et al., 2004. Origin, diffusion, and differentiation of Y-chromosome haplogroups E and J: inferences on the Neolithization of Europe and later migratory events in the Mediterranean area. American Journal of Human Genetics 74: 1023-1034. Achilli A. 2004. The Molecular Dissection of mtDNA Haplogroup H Confirms That the Franco-Cantabrian Glacial Refuge Was a Major Source for the European Gene Pool. American Journal of Human Genetics. 75: 910–918. Myres NM, et al. 2011. A major Y-chromosome haplogroup R1b Holocene era founder effect in Central and Western Europe. European Journal of Human Genetics volume 19, pages 95–101. 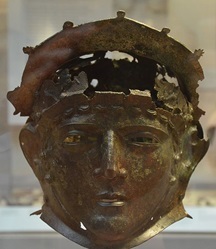 Cavalry Face-Mask Helmet, from Ribchester, late 1st or early 2nd century AD, Roman Britain, British Museum. Wikimedia (https://commons.wikimedia.org/wiki/File:Cavalry_Face-Mask_Helmet,_from_Ribchester,_late_1st_or_early_2nd_century_AD,_Roman_Britain,_British_Museum_(14219335552).jpg).